Listereon is a Modern, Creative and Clean Designed PSD Template for Directory Listing Business. It can be used for Global or Local Business Directory Website. It comes with 19 layered PSD files to help you to create beautiful listing and directory site. All necessary pages and elements included. You can coverts it to your favorite language and platform. All elements are well organized group and layered. You can easily edit this template. All layers and objects are perfectly customizable and everything is grouped within it’s respective place. 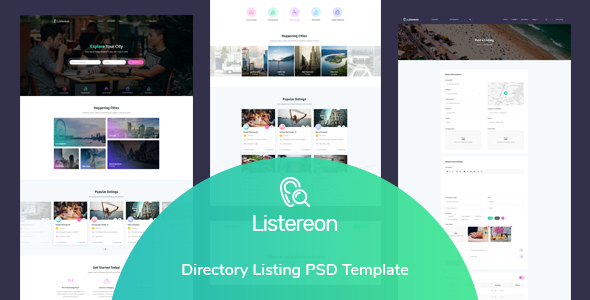 Listereon PSD is a high quality Directory Listing Template that will wow your visitors, it has a timeless, spacious design with neutral color scheme that will fit any kind of Directory Listing.